NMS server has a wide range of settings for video streams sharing and allows the users to create complex monitoring systems with spread recording and surveillance centers containing many personalized operator stations. NMS has no license restrictions on the number of connected devices, number of users and drives capacities, and that gives a possibility to create systems with a several hundred cameras. Customizable user interface and multi-screen mode allows the system operator to work effectively. 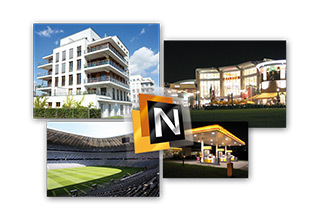 NMS software is distributed free of charge with IP NOVUS ® cameras. The license for the program is free regardless of the size of the system, the number of devices, the size of the recordings database etc. 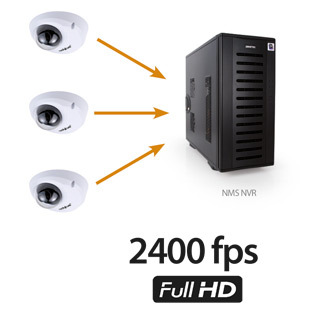 When buying a NOVUS® IP camera, full-featured software to create IP CCTV system is included. Over time the system can be expanded with new elements without any additional fees. NMS software allows the user to create the registration and preview systems made of an unlimited number of IP cameras. The size of the system is limited only by hardware performance – IP NMS recorders and network elements. Customizable user interface and multi-screen mode allows the system operator to work effectively. NMS software very effectively uses the resources of the server on which it is installed. Based on one NMS server a stable system that supports up to 80 cameras (with Full HD resolution) can be created. By using the appropriate server and the appropriate number of hard drives up to 2400 fps in Full HD quality can be recorded. For comparison, the classical recorders used in systems with analog cameras allow the user to record up to 32 channels at a rate of 800 fps in CIF resolution (which is almost four times worse than HD 720p). During the installation of NMS software it is the user who decides how the software will be used in the future. The user can choose a classic application, where the cameras streams are simultaneously recorded and observed by the operator in one location, on one workstation – NMS Server/Client. It could also be an application designed exclusively for recording – NMS Server or for preview – NMS Client. At least two workstations are required then: at least one NMS server and at least one NMS client. According to the workstation destination the optimized version is installed. A classic home computer or even a laptop can be a client station. Versatility of applications makes NMS ideal for small systems with four cameras, as well as extensive systems with several recording servers and hundreds of cameras. Contrary to popular belief the IP system can be easily installed. NMS software offers a set of tools to help the installer easily and quickly configure the IP video surveillance system. System configuration is reduced to two steps. The first step is to configure the cameras. 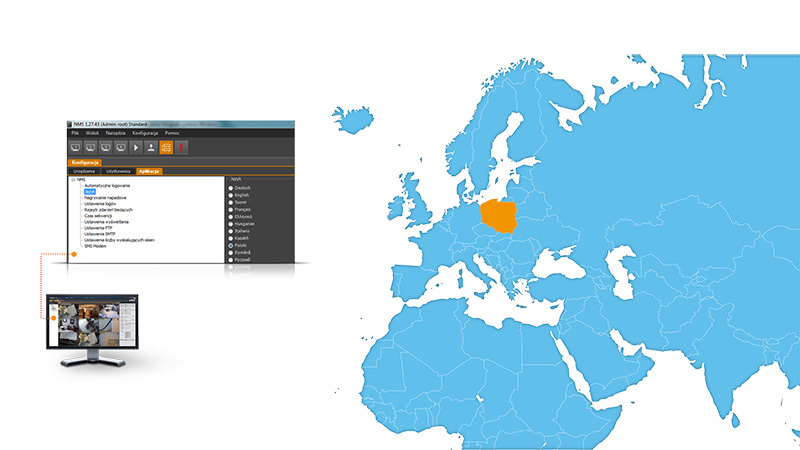 NMS IP Tool application finds all NOVUS® IP cameras working within the network and in a very simple process gives them a unique "group" network addresses. The second step is to configure the NMS using the basic setup wizard. In a user-friendly way the setup wizard allows the user to add cameras to the list of devices and to assign the appropriate disc space for recordings. It is also possible to configure systems with server-client architecture. After these two steps the monitoring system begins to work, which means it records and displays the images from the cameras. More extensive configuration menu, through which the installer can make more advanced settings, is also available. 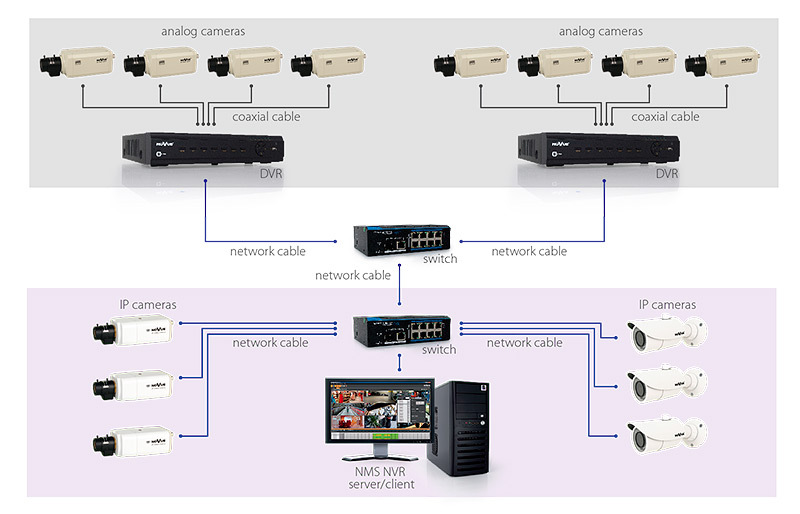 NMS software supports NOVUS® H and B Series analog video recorders. 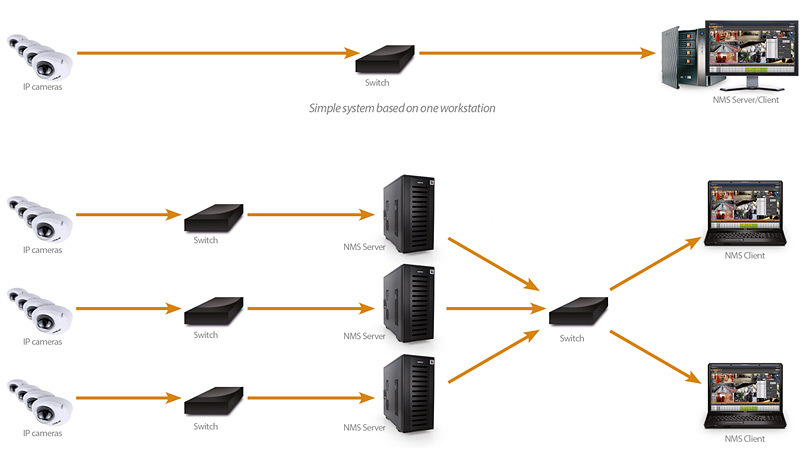 In hybrid systems the recorders are connected to analog cameras and via IP networks the entire installation is connected to NMS. By doing so, analog cameras and IP cameras can work simultaneously (in any configuration) in one monitoring system. This is an easy way to expand and modernize existing analog systems. Many people who have analog CCTV systems is not changing them to IP technology, because they do not know what to do with possessed cameras and they are overwhelmed by the costs of creating a new installation from the beginning. The hybrid monitoring is perfect for such cases because it allows for a gradual replacement of equipment and the use of modern solutions that are offered by network monitoring systems.